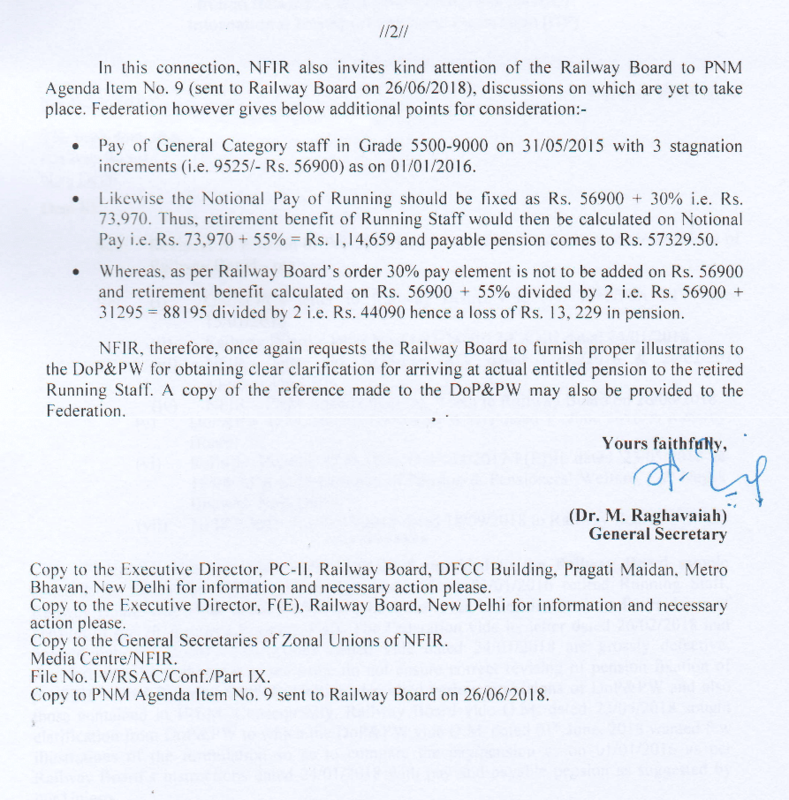 Sub: Revision of Pension of Pre-2016 Retired Running Staff- Improper instructions of Railway Board – reg. (iii) NFIR’s letter No.II/35/Part XIV dated 12-02-2018 & 26-02-2018 addressed to CRB. (v) DoP&PW O.M.No.38/17/18-P&PW (A) dated 1st June 2018 to Railway Board. 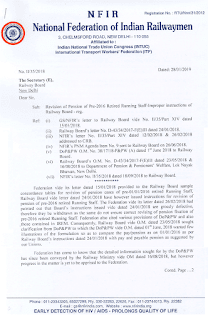 (vii) NFIR’s letter No.II/35/2018 dated 19.09.2018 to Railway Boards. 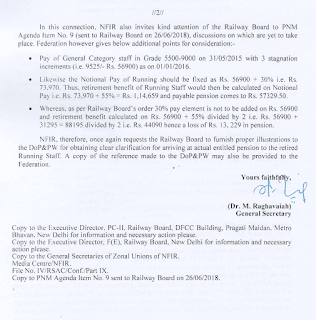 Federation vide its letter dated 15-01-2018 provided to the Railway Board sample concordance tables for revision of pension cases of pre-01-01-2016 retired Running Staff. Railway Board vide letter dated 24-01-2018 have however issued instructions for revision of pension of pre-2016 retired Running Staff. The Federation vide its letter dated 26-02-2018 had pointed they be withdrawn as the same do not ensure correct revising of pension fixation of pre-2016 retired Running Staff. Federation also cited various provisions of DoP&PW and also those contained in IREM. Consequently, Railway Board vide O.M.dated 23-05-2018 sought clarification from DoP&PW to which the DoP&PW vide O.M.dated 01st June 2018 wanted few illustrations of the formulation so as to compare the pay/pension as on 01-01-2016 as per Railway Board’s instructions dated 24-01-2018 with pay and payable pension as suggested by our Unions. Federation has come to know that the detailed information sought for by the DoP&PW has since been conveyed by the Railway Ministry vide OM dated 16-08-2018, but however progress in the matter is yet to be apprised to the Federation. whereas, as per Railway Board’s order 30% pay element is not to be added on Rs.56900 and retirement benefit calculated on Rs.56900 + 55% divided by 2 i.e. Rs.56900 + 31295 = 88195 divided by 2 i.e. Rs.44090 hence a loss of Rs.13,229 in pension. 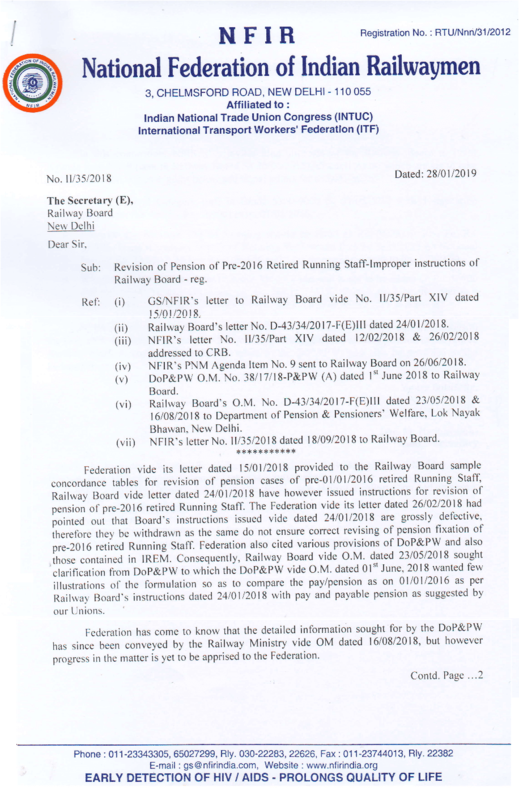 NFIR, therefore, once again requests the Railway Board to furnish proper illustrations to the DoP&PW for obtaining clear clarification for arriving at actual entitled pension to the retired Running Staff. A copy of the reference made to the DoP&Pw may also be provided to the Federation.